Great stairs make a house. Right in the entry you have these amazingly intricate gothic stairs. The sharp angles contrast the swooping cello-style corner scroll which has been hand adzed, just like the doors of the garage we just tore down (not to fret, the doors were saved), and the caps on the stair posts. The original wallpaper is just as noteworthy. 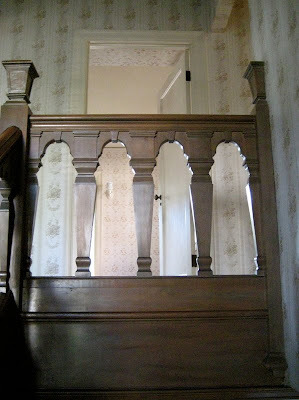 There is one layer of wallpaper on the walls, one coat of paint on the trim. 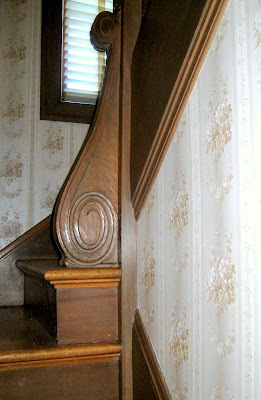 For a 90 year old house, someone exercised remarkable restraint. You ROCK Shiloe. Take it all the way, that must be your motto. I'll stay posted on this.